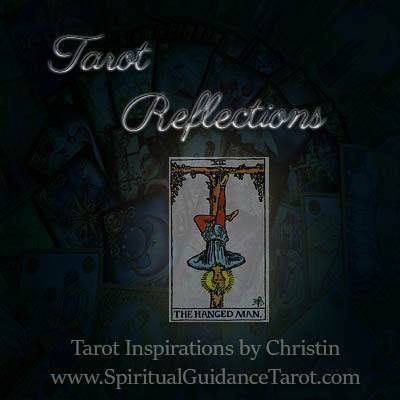 The Hanged Man tarot card speaks of being in limbo or stuck. The man is left hanging upside down and he doesn’t seem to be doing a lot to free himself. He’s not in distress apparently, but he sure isn’t going to accomplish much just hanging there. This card comes up often when we are not challenging ourselves enough or when we are “settling” for what is less than ideal due to fears of change or moving into the new and unknown. If you feel stagnant, it’s the universe’s way of telling you to sit down and figure out what you truly want and then take some inspired actions to move in that direction. Remaining in comfort zones is ultimately more harmful than taking some risks and taking a chance. The hanged man talks about the unexpected events which throw us off balance. When the Hanged Man comes up for daily guidance he expresses the need to let go of struggle and find acceptance with the conditions in our life. When we let go of struggling to figure things out or force resolutions peace comes. In the midst of struggling against the uncontrollable, we become unable to right our positions. The advice he gives us for the day is to stand back from the situation, take a deep breath and just go with the flow. Come to terms with what has been, and release old worries and stress so that you can turn upright with a new outlook. Although we can’t always change our outer circumstances, we can make things better simply by letting go and enjoying the ebbs and flows of life. Stand still take a breather, things will work out.